There were over 330 submissions made to this review with many people highlighting their personal experiences of the PIP process. Mr Rader highlighted that the current process is viewed with suspicion and distrust by many people. He stated that it is a fragmented process that can have a negative impact on claimants and those who support the claimants. This is particularly true of the face-to-face assessment process which can cause stress and anxiety and have knock-on impacts on the health and well-being of the claimant, family members, wider support networks and put pressure on already stretched support services. The point was stressed that this process is still in its relatively early days and much learning is still needed. One of the first points Mr Rader raised was the different ways people with the same diagnosed condition are impacted in terms of their daily living functions and their mobility. Therefore, a one size fits all process is highly insufficient. Much also remains to be done in terms of communicating the PIP process to claimants, family and support networks and organisations. The PIP process is viewed as negative, this is particularly true of face-to-face assessments. This puts additional pressure and stress on claimants, family support networks and support and advice services. Relevant and up-to-date medical evidence is a necessity, and this should be taken into account at the beginning of the process. This information could be obtained from GPs. Further attention should be given to gaining information on claimants' functionality from those who see them and support them on a regular basis (suggested GPs are not best placed to provide this information). Further consideration is needed around what constitutes relevant information- where it can be found and at what point in the process it should be submitted. Greater openness and transparency is needed in the process to help build trust and credibility. The Department, in conjunction with the advice sector should coordinate a number of information and outreach events to ensure that claimants, family members and support workers have a clear understanding of the PIP process and help them to unpack this process. The Department to look at the language and terminology used in the PIP assessment process with a view to simplifying and consolidating terms. Care should be taken to ensure that the terms, words and titles used do not misrepresent the roles undertaken, or the nature of the PIP assessment process. The use of DLA evidence to support reassessment should cease as this evidence may not be the most up to date account. The Department should review written material, particularly initial letters to claimants as well as decision letters to ensure the message is clear and concise. The Department should develop simple straightforward material describing the PIP assessment process. The Department ensures there are suitable, accessible options for those with particular needs such as communication requirements, including those with visual and hearing impairment, as well as those who cannot hand write, to allow them to apply for PIP where telephone and hand-written completion of PIP forms is not suitable. That the Department reviews the training provided to staff ensuring that awareness is raised regarding the options available for claimants who find it challenging or impossible to communicate by telephone. The clinical judgement of a medical practitioner, indicating that the claimant has a terminal illness should be sufficient to allow special rules to apply. The six-month life expectancy criteria should be removed. 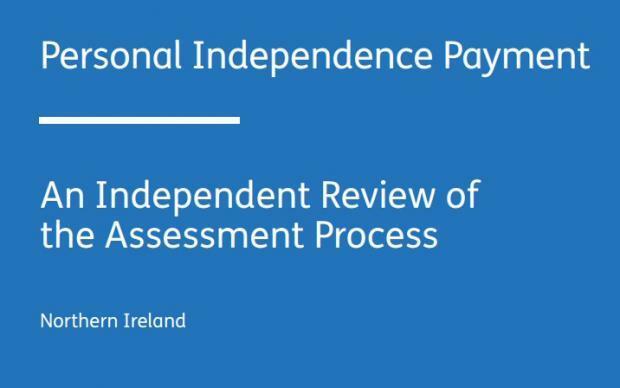 The Department should reach agreement with the relevant professional bodies as to how they may best obtain a GP Short Summary Report to support the PIP2 submission. This should be requested for every claim. The Department should establish a short term ‘Task and Finish’ group, involving stakeholder organisations and medical experts, to develop a set of criteria detailing which conditions would be more appropriately addressed through the Paper-Based Review approach. This should cover conditions with no prospect of improvement and/or with life-limiting implications. It could also cover those who face challenges representing their condition and functionality in the face-to-face assessment. It will be vital to set out clearly the relevant information and evidence which would be required to permit an assessor to complete a Paper-Based Review in these cases. The Department should urgently address the issues raised by claimants. This includes but is not limited to: How appointments are scheduled; this should include reasonable adjustments, taking account of claimants’ conditions and the practicalities of attending appointments. Cancelling or rescheduling appointments; ensure changes or cancellations are minimal and, if they occur, that claimants are informed as soon as possible and by an appropriate communication method. The assessment room; layout of the room should consider both the space required for claimants with mobility aids and the presence of their accompanying person. The Department and Capita should develop enhanced training in relation to certain groups of conditions presented- assessors need to have more than a basic understanding of conditions. If a claimant indicates, and can prove, they are affected by one of these conditions they should have the opportunity to see an assessor with enhanced training relevant to their condition, or to have a Paper-Based Review. The Department should introduce audio-visual recording of assessments in both home and assessment centre locations. Informal observation in the assessment process should be removed or revised. If revised, assessors should be required to justify the conclusions which they have drawn from their observations. All questions about suicide and self-harm should be removed from the assessment. If they deem this information essential they should source it in an alternative manner. When the letter of decision goes to claimant, this should be accompanied by the assessor's report to provide clarity on the grounds by which a decision was made.